In The New Christmas Canon, The A.V. Club looks beyond Rudolph’s nose and Zuzu’s petals to highlight entertainment from the ’90s, ’00s, and ’10s that’s become a seasonal staple—or deserves to. The performers in the clip above have done their fair share of pretending. Throughout his recording career, Elvis Costello has worn the costumes of the “Avenging Dork,” Napoleon Dynamite, and a guy who could stand to ease up on his T Bone Burnett fetish. His duet partner, Stephen Colbert, spent the better part of a decade living between quotation marks, satirizing blustery pundits by acting like one of their own. At the top of 2008’s A Colbert Christmas: The Greatest Gift Of All!, Colbert even reveals that Elvis Costello isn’t the bespectacled singer’s given name: As known by the host and the smartypants record collectors in his audience, the singer was born Declan Patrick McManus. Furthering their commitment to fakery, the faux-neo-con and the pseudonymous Elvis perform “There Are Much Worse Things To Believe In” against a patently artificial backdrop. They’re seated by a snow-covered door that doesn’t lead to the outside and a faucet that likely lacks even the most basic plumbing hookup. With most popular entertainment, we put this kind of stuff out of mind. But that’s not the case with A Colbert Christmas—not when Colbert has spent the previous 40 minutes drawing attention to the inauthenticity of his surroundings. We really wanted to create something that wasn’t really cynical or dark or distant or alienating. We really wanted to do something that was in keeping with the spirit of the show that we do every day, but also really was somehow sincerely celebrating the season. And so that’s what our attempt was. And those shows were all the inspiration. You know, let’s find out what was actually enjoyable about those. Why did we actually watch the Andy Williams specials when we were [kids]? A Colbert Christmas primarily works in broad strokes of parody, allowing the oversized personalities on the guest list to fill in the outlines—like when Toby Keith arrives in the guise of a gun-toting shitkicker. Keith’s number, “Have I Got A Present For You,” most closely resembles the type of satire that was The Colbert Report’s bread and butter, giving the imagined War On Christmas (the “Blitzkrieg On Grinchitude,” in the Report’s parlance) its own “Courtesy Of The Red, White, And Blue (The Angry American).” Like the image of a buffalo-plaid-clad Keith brandishing a camouflaged machine gun, it’s both hilarious and terrifying. 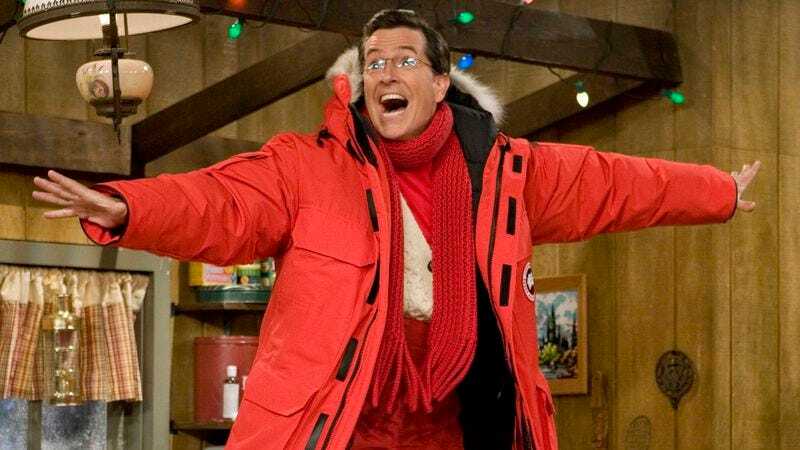 A Colbert Christmas was produced in an environment that made partisan talking points out of Christmas trees and Nativity scenes; as such, it’s strange that the special more or less removes “Stephen Colbert” from the context of his regular gig. In some ways, this is a durability test for the persona: Would his pompousness, selfishness, and stubbornness land if he’s not putting his political enemies on notice? The New York Times didn’t think so, with the paper of record’s review suggesting “it might have been funnier to keep him in his natural habitat, the television studio.” (Though the byline on that review belongs to the notoriously inattentive Alessandra Stanley—who once got the Colbert-ism “truthiness” confused with “trustiness”—so take it with a grain of salt.) But looking backing at the special in 2015—a whole year after “Stephen Colbert” took to the night’s sky in the series finale, alongside Santa Claus, an Abraham Lincoln unicorn, and Alex Trebek— it’s apparent what type of fully fledged, soundly constructed character Colbert and his team had wrought. Tweaking a traditional “Christmas is canceled” plot, A Colbert Christmas finds a way to make the holiday all about Stephen: Christmas simply won’t come unless he makes his way out of the mountains and back to the studio, where Costello, the Jonas Brothers, and a bunch of goats disguised as other animals are waiting for him. It’s remarkable that anyone involved with A Colbert Christmas had the time to escape the “natural habitat” of that studio: The special came together in the lead up to the 2008 U.S. presidential election, the first to occur during The Colbert Report’s lifespan. It must’ve been a relief to take a break from Sarah Palin and the looming financial crisis to talk latkes (“What are they?” “Potato pancakes”), dreidels (“What are they?” “Wooden tops”), and candles (“What are they?” “They are candles!”) with Jon Stewart. At the very least, Colbert was enough of a trooper to keep any exhaustion below the surface: He sinks his teeth into every second of A Colbert Christmas, as he’s finally granted a non-Lord Of The Rings excuse for tapping into the elfin glee that’s part of his screen presence every other day of the year. Its cabin, choreography, and roaring fire are all bogus—but the enthusiasm is the real deal. One of the special’s funniest fakes comes late in the hour, through an old-fashioned editing trick and a little bit of Christmas magic. “Yes, Stephen, I’m just as real as you are,” Santa Claus tells his host, before yanking off his beard to reveal Stephen Colbert playing “Stephen Colbert” playing Santa. It’s a tired gag, but Colbert’s commitment totally sells it—even as the width of his grin and the crazy gleam in his eye signal that we’re not supposed to take the moment at face value. It’s not supposed to warm your heart, but it is supposed to make your belly shake like a bowl full of jelly. That’s the reaction the Colbert Christmas team received when they showed the special to a live audience, whose laughter is heard in the original broadcast version. It’s a genuine response to footage where everything but the sentiment is ersatz. “And after it was over, we’re like, ‘We’re so thrilled that they like the parts that we like, because we didn’t know until then,” Colbert said on Fresh Air. “And it occurred to us that we had made something that was sincerely strange but also strangely sincere.” The Colbert Report trusted that its audience would like a silly little Christmas special—and there are much worse things to like than a silly little Christmas special.